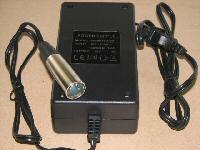 * Look over the battery chargers we sell on this page. We sell universal use battery chargers for nearly all scooters. All you need to know is how many 12 volt batteries are installed in your scooter to determine the voltage of the electrical system (two 12 volt batteries would be a 24 volt system). Most scooters use lead acid batteries, but some use Lithium or even LiP04. Chargers should match the type batteries used. * Find a charger that matches your scooter's battery electrical system 12, 24, 36, or 48 volts beginning at the top of the page and scrolling down until you find a charger of the correct voltage (they are all standard AC input for 110/220 volt, with only one Euro plug charger, the rest standard American) for charging 12, 24, 36, 48, 60 volt output and the connector mates to your scooter charge receptacle. The most common charger plug is a 3 prong female type that mates with a three pin male receptacle, but other plugs like the PC style and XLR are also used and pictured/described. * Note that battery charger output DC voltage is alway slightly higher than the system voltage so that, for example, a 24 volt charger would output 29 volts in order to charge the battery set of two 12 volt batteries connected together in series. With this information you should find a charger that will charge your batteries and automatically turn off when finished, providing a light indication for full charge. * Electrical components are not covered by warranty for return to exchange or for refund. Parts are tested prior to packaging for correct operational condition. If your battery stystem is not malfunctioning then the charger will operate correctly on receipt, but if your previous charger malfunctioned because of a system problem then your new charger will also fail. Many of our charger have some fuse protection inside the case to help prevent a total burn out and the fuse can be replaced. 90-245V AC input with 16.5V DC 1.0A Output for 12 Volt cells. Intelligent Battery Charger provides current to battery set at correct amount to charge without overheating, shut off when batteries are charged. Choice of connector, XLR male or standard female. 100-240V AC Input with +24V DC 1.6 Amp Output. OEM Brand 24 volt, three pin Battery Charger as used on many Scooters including Schwinn, Mongoose, GT, and Currie. Charger with indicator light shows when charging and fully charged. Matches socket below. 90-110V AC input with 42.6V DC 1.6 Amp Output for 36 volt battery sets. Same charger as used on some X360 Scooters when 3 pin female connector is selected in the drop down menu. 36 volt, three prong Battery Charger with either standard female connector or XLR Male Connector, connected and ready to use. Charger with indicator light shows when charging and fully charged. May be used with two prong Battery Charger connectors by using the old two prong plug from the previous Battery Charger. Or purchase the three prong socket for replacement to match this Battery Charger connector. Intelligent Battery Charger provides current to battery set at correct amount to charge without overheating, shuts off when batteries are charged. Indicator light shows red during charge, green when charged. WE NOW SHIP THE 36 VOLT 3 PIN CHARGER WITH THE MATCHING 3 PIN MALE SOCKET IN PLACE OF THE 2 PIN VERSION BECAUSE THE OEM 2 PIN CHARGER IS NO LONGER AVAILABLE. The socket easily installs in place of the old 2 pin socket and still uses only 2 of the three pins. 36 volt OEM Brand Battery Charger, three pin plug choice, as used on many Scooters including some X-treme Models, MX500, etc. Charger with indicator light shows when charging and fully charged. Matches socket below. 90-110V AC input with 41.8V DC 1.6 Amp Output for charging 36 volt lead acid battery sets. Intelligent 48 volt, three prong PC Style connector plug, Fan Cooled, Intelligent Lead Acid Battery Charger with 90-110V AC input and 53.5V DC output (for 48 volt battery set) and up to 3 Amps Output. Charger with two indicator lights show when charging and fully charged. Polarity for most Pantera scooters or standard scooter polarity: Usual Panterra Polarity (N=Negative, L=Positive), Standard Polarity (N=Positive, L=Negative) where the PC plug is marked with N and L at the connectors. Intelligent 48 volt, three prong PC Style connector plug, For large electric scooters like the Panterra. Amperage output is up to 9 Amps. Fast charge use for Panterra (Freedom electric), Panterra (Fusion electric), Panterra (Retro Electric), and Various makes/models of electric scooters of different connection polarities. Fan cooled for heavy duty use, fuse protected. Pretested in load environment for a 48 volt battery set. Also, a standard scooter polarity version of this same charger for many brands of scooters using this type connector. Intelligent 48 volt 9 amp, three prong connector plug, Fan Cooled Heavy Duty fuse protected Charger for large electric scooters. Amperage output is up to 9 Amps to reach a charge state before reducing back to keep heat lower so batteries will charge without over heating. Fast charge use for Various makes/models of electric scooters. Pretested in load environment for a 48 volt battery set. Choice of output connectors. CONTROL BOXES - Control Boxes are rated in Wattage, Volts and Amps for different scooter system voltages, 24, 36, 48, and 60. Maximum peak watt motor usage is typically found by multiplying volts times amp rating when amps given is peak amp rating. Sustained wattage can be found by multiplying volts times run amp rating. In general when you see a wattage rating shown that is less than the product of multiplying the amps and volts it means the amps rating is the peak or maximum rating the control box can safely handle during acceleration from a stop or such loads. The normal operating amperage can be found by dividing the given wattage in this case by the voltage. YOUR BEST ADVICE IS TO BUY THE LARGEST CONTROL BOX RATING IN WATTS FOR THE SYSTEM VOLTAGE OF YOUR SCOOTER THAT PHYSICALLY WILL FIT IN THE CAVITY WHERE YOUR CONTROL BOX MOUNTS. No returns due to the nature of this device. Installation is suggested by a competent person using care to avoid misconnection and static electricity that will cause a defect. HOW TO SELECT THE BEST CONTROL BOX FOR YOUR REPLACEMENT: These control boxes were selected for maximum universal replacement of almost all scooters as quality devices. To determine the best replacement you should first consider the voltage of your scooter where the number of 12 volt batteries yields the total voltage when combined (e.g., three batteries will be 36 volts). The wattage of the motor the controller will provide power to should be determined so that, for example, a 350 watt motor would need a control box capable of at least 350 watts output or more. Controller wattage can be higher than the motor wattage and make the controller less likely to overheat or burn out. You should also consider the connectors your existing control box has to the component harnesses so that you might be able to simply plug in the new control box (e.g., if your scooter has a six pin connector for the throttle/brake lever/speed indicator then that would be preferable to a control box with separate connectors for the throttle and brake lever, but we sell a connector package to allow new connectors for the existing wiring harness). And you need to consider whether you have room for the physical size of the new control box in the area of your old control box. Connector problems can be overcome by using a replacement universal conector package we sell on this page if, it comes to that, and the connector set is not expensive with the most used types. And most scooters can accomodate a larger control box. Also, do look at the Wiring Connection diagrams and information links provided in the part descriptions, and be sure to mark your connectors on your scooter as they are used for the different components (e.g., throttle, switch/lock, brake lever, brake light, charger socket, on/off power indicator light, motor, and battery set. NOTE: Most people do not know that control boxes limit the current to the motor to help prevent burn outs during acceleration and heavy use. This restricts the full power of the battery set from being applied to the motor, restricting the acceleration and top speed to some extent. Control boxes are designed to shut off when current reaches a maximum for the rating of the control box, and when the voltage drops to the minimum that is quoted. This again helps protect the control box. For example, if you have a 36 volt system with a control box rated at 40 amps for a 1000 watt motor and your motor pulls more than 40 amps under a full load or causes the voltage to drop below the cut-out rating of 32 volts, the control box will attempt to shut down causing the scooter to not reach full speed as the scooter bucks with the motor cutting in and out in a fluctuation. Remedy, a smaller motor or a 1000 watt motor that draws less amps under the same load. Note that load is actually the weight of the scooter, rider, and environment of use (road condition, hills, etc.). As an alternative higher loads may force the use of a 48 volt or higher voltage system to drop the amperage down through a control box to the motor. One inventive individual provided us an article on how to use a relay system to safely direct connect the battery system to the motor for brief acceleration and high speed, bypassing the control box briefly. This article is available on this site in our performance section. OEM Part for the X-10 Scooter. No returns or exchanges due to the sensitive nature of this device (Buy at your own risk). Installation is suggested by a competent person using care to avoid misconnection and static electricity that will cause a defect. Pin ID Picture of Original Vapor Controller. OEM (original equipment manufactured) controller for the X-treme X-250 as currently manufactured. No returns or exchanges due to the sensitive nature of this device (Buy at your own risk). Installation is suggested by a competent person using care to avoid misconnection and static electricity that will cause a defect. REVERSING controller: 24 volt has 8 connectors and 36 volt has 7 connects. Max Current 30 Amps. Usable Motors: up to 500 Watts. 4"L (including mounting tabs) X 2.5"W X 1.5"H. Rated Voltage: 24 or 36 Volts, Rated Motors up to 500 watts, Rated Current to 30 amps, Conversion Efficiency: 95%, Under voltage protection: 20.5 volts or 31, Speed control: Hall effect Turn or thumb throttle, Brake light (24 volt only), Power Indicator (24 volt only), 36 volt has 2 Wire Lock/Switch Connector and 2 Wire Reverse connector while the 24 volt version has a 3 Wire Lock/Switch Connector with Forward or Reverse function, Charger connector, Brake Lever cut-out connector, Motor connector, and Battery connector. The 36 volt version also has a 3 wire connector for speed control: All disconnected HIGH, Medium and Low speeds as connections are made according to the wiring chart. Possible easy mount switch assembly for use in forward and reverse control is our handlebar mounted switch assembly or three position key switch sold below. Current Limiting prevents motor current from exceeding the specified value and avoids damage to the motor and control box due to over current conditions. Under voltage protection when the battery voltage falls to specified value, cutting battery output and preventing over discharge which extends battery life. Over speed prevention while charging renders the throttle temporarily inoperable and prevents mistaken operation. Power cut-off during braking. Simple connector plugs use or splice of harness wires to existing scooter wiring from control box or to components. (5L X 3.5H X 2H). YK42-2. This 30 amp controller is a replacement for electric Scooters using up to 500 watt 24 volt motors. Undervoltage protected (20.5 volts). Just connect two wires (usually red and either blue or green) to motor, 3 wire connector for hall effect throttle, and red and black wires to 24 volt battery set through a heavy duty switch or relay in the black wire part of the circuit for high quality and endurance you need. Tested prior to packaging. No returns or exchanges due to the sensitive nature of this device (Buy at your own risk). Installation is suggested by a competent person using care to avoid misconnection and static electricity that will cause a defect. 24 Volt 40 Amp (40+/-1 Amps) for 500 Watt brush type motors. This controller is a superior upgrade heavy duty device that has 6 commonly used connectors: Power Source - black/red wires, 2-pin male, Motor - blue/yellow wires, 2-pin female, Brake Lever - black/yellow wires, 2-pin female, Throttle (Derailler) - red/black/blue where blue and green are always interchangeable color wires, 3-pin female, 2-pin female, On/Off (Lock)Switch - red/blue wires, 2-pin female, Charging Port - red/black wires. We can also provide this controller with a six wire connector standard for the throttle and brake lever connection for scooters with this configuration. Select it below. Simple standard installation using new controller's clearly marked and identifed connector plugs, or use controller connector set sold separately below to match your wiring harness connectors, or use existing old controller connectors by detaching the blades in the new connectors and inserting in the old molex connectors as necessary (small screwdriver or jewelers screwdriver required to remove blades). CT-660B9. This controller has 7 connectors. Rated Voltage 36 Volts. Max Current 40 Amps. Usable Motors: 1000 Watts or less. Diminsions: 5"L X 3"W X 1.5"H. Rated Voltage: 36 Volts, Rated Motors to 1000 watts, Rated Current to 40 amps, Conversion Efficiency: 95%, Under voltage protection: 31.5 volts, 6 wire connector for throttle/brake lever/speed indicator, Brake Light, Power Indicator, Charger Connector, Lock/Switch connector, Motor and Battery connectors. Current Limiting prevents motor current from exceeding the specified value and avoids damage to the motor and control box due to over current conditions. Under voltage protection when the battery voltage falls to specified value, cutting battery output and preventing over discharge which extends battery life. Over speed prevention while charging renders the throttle temporarily inoperable and prevents mistaken operation. Power cut-off during braking. Simple connector plugs use or splice of harness wires to existing scooter wiring from control box or to components. 36 Volt for up to 1000 Watt or less brush type motors, 30 amp for 800 watt motors. This controller is a superior upgrade heavy duty device that has 6 commonly used connectors: Power Source, Motor, Brake Lever, Throttle (Derailler), Switch On/Off, and Power Indicator. Charger should be wired directly to the battery for most versions of this universal control box (use harness of old control box if using for replacement). Some versions of this control box may have a brake light, too. Simple standard installation using new controller's clearly marked and identifed connector plugs, or use controller connector set sold separately below to match your wiring harness connectors, or use existing old controller connectors by detaching the blades in the new connectors and inserting in the old molex connectors as necessary (small screwdriver or jewelers screwdriver required to remove blades). YK42-3. A great buy on this heavy duty simple 40 amp control box for up to 800 watt electric 36 volt motors. Just connect to motor, 3 wire connector for hall effect throttle, Brake lever cut out switch (on some versions), and then 36 volt battery set through a switch for high quality and endurance you need. 7.5"L X 3.5"W X 2"H. For scooters with wiring similar to the Rad2Go E36 Great White Scooter. This control box has a large shared red (positive) lead to both the battery terminal AND motor, with a Blue (or Green) negative large wire to the Motor, and a heavy duty toggle switch or relay switch in the Black wire battery circuit for On/Off control. 1000 Watt - 48V Brushed Motor Controller (YK33F). This controller is for brushed (Also known as "PM" or "Magnet" motors). This controller is offten referred to as a YK33F - very similar to a LB37. Great controller, durable and long lasting. Amp rating 30 amp for 1000 watt motors, 40 amp for 1500 watt motors. For the price you can't go wrong. Wiring the controller: Thick Red/Black: Batt (Red+, Black-), Thick Blue/Yellow: Motor, 2 harnesses are Thin Yellow/Black: Brake Switch (When closed throttle is disabled), Thin Green/Black/Red (Derailleur): Throttle (Red: +5v, Black: Ground, Green: Signal), Thin Black/Red (Charging Port): Charging Port, Thin Black/Red (Indicator): Power light (Provides full pack voltage when power/key is on, used to run an indicator light), Thin Black/Red (Brake Light): Brake Light, Thin Blue/Red (Power Locks): Key or power switch (When closed power is on), Thin Green/Yellow (Sport): Unused. 4.5"L X 2.75"W X 1.5"H.
48v500wUniv - 48 volt for 500 watt brush type electric motors. 6 plug connector harness supports key switch, power indicator, 3 wire throttle, 2 wire brake lever cutout switch cuts battery output, motor, and battery. Charger should be wired directly to the battery for most versions of this universal control box (use harness of old control box if using for replacement). Some versions of this control box may have a brake light, too. Simple standard installation using new controller's clearly marked and identifed connector plugs, or use controller connector set sold separately below to match your wiring harness connectors, or use existing old controller connectors by detaching the blades in the new connectors and inserting in the old molex connectors as necessary (small screwdriver or jewelers screwdriver required to remove blades). 4.5"L X 2.75"W X 1.5"H.
YK42-4 - A great buy on this heavy duty control box rated 40 amp for 1500 watt electric 48 volt motors. 6"L X 3.5"W X 2"H. Just connect to motor, 3 wire connector hall effect throttle, and then 48 volt battery set for high quality and endurance you need. These control boxes for rear hub motors may or may not be compatible with other scooter applications. Only a competent mechanic should attempt connection of any hub motor control box due to the complexity of wiring. All control boxes and electronic parts are sold without the ability for any return or exchange due to the sensitive nature of these sensitive devices to static electricity induced burn outs and unintentionally induced defects. No manufacturer will warranty any control box or accept returns or exchanges. Universal set of Scooter Connectors. Six male and female standard white Molex connector sets: two, three, four, six pins, 2 pin motor, and battery 2 pin connector sets. Makes installation of control boxes easier. Blades included. Modular black mini set of Scooter Connectors. Five male and female standard Modular connector sets: two, three, four, five, and six pin connectors in this set. Makes installation of control boxes easier especially when using control boxs with white molex connectors as replacements. Blades included. Universal scooter throttles fit common 7/8 inch diameter scooter handlebars and are also known as Twist Grip throttles. Todays throttles use no parts that wear from friction and are known as Hall Effect throttles that work by inductive magnetic control. Only three wires are used to control the scooter speed, a black ground wire, red voltage wire, and green or blue signal wire that control boxes we sell sense the change in induction to change the motor speed. Other wires in throttle harnesses may be for an indicaiton of battery condition, speed, or other indicators attached to the throttle. Throttles can also be Thumb Control that work similarly to control the speed, or even pedal controls for floor foot control mounting. Other types of throttles can be simple on/off switch controls for simple small scooters and they will have two wires in the harness. Plug ends may vary from throttle harnesses and these are called box ends, blade ends, or mini plug ends like used on the X-10, X-140, and Vapor scooters to name a few. Throttles below are both universal throttles made originally for a scooter production, or current OEM (Original Equipment Manufacturer) available throttles that match grip styles or wiring exactly and cost more. All throttles are tested for proper quality and working condition. Twist Grip Motorcycle Style Throttle and 3 wire cable (black, green, red) for all 7/8 inch standard handlebars. Otherwise known as a Hall Effect Throttle. Vapor and X-10 mini connector below. Standard three wire hall effect electric scooter throttle with red, green, and black wires. Matching left grip. 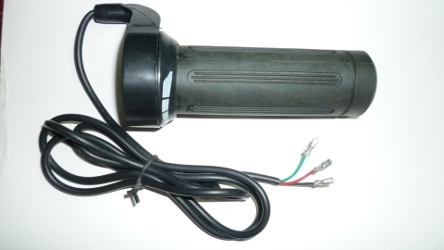 Silver Trimmed Standard 56 inch three wire hall effect electric scooter throttle with red, green, and black wires to blade connectors that insert into white molex connectors. Matching left grip. Engine push button starter/kill switch to which the twist throttle can attach for pocket bikes, mini choppers and scooters. The yellow button can be wired as a push button starter, kill switch or even possibly a reverse switch for mobility scooters with a simple two wire make contact function. 3 Wire Hall Effect Thumb Throttle Control and 5 feet cable harness, Red (4.3 Volts), Green (or blue - Speed Adjusting Signal), and Black (Ground), or as indicated in the package. May be used in any voltage system with the standard three throttle wires. 7/8 inch standard handlebar mount. 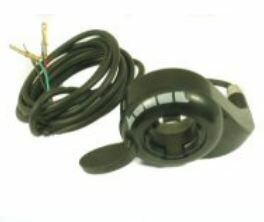 Hall Effect Thumb Throttle Control with Grip and 5 foot 4 wire cable harness, Red (4.3 Volts), Green (or blue - Speed Adjusting Signal), Black (Ground), 4th wire - White wire (or Yellow to Power Indicator of the control box), or as indicated in the package. Insert blades in existing white Molex connector for quick repair. 7/8 inch standard handlebar mount. Hall Effect Half Throttle Control and 3 wire cable harness: Red (4.3 Volts), Green (Speed Adjusting Signal), Black (Ground). Insert blades in existing connector or splice for quick repair. 7/8 inch standard handlebar mount. 4 Pin, 4 Wire, Not compatible with Razor 5-wire throttles. Hall Effect Throttle Control and 40 inch 3 wire cable harness (terminating in bare wire), Red (4.3 Volts), Green (or blue - Speed Adjusting Signal), Black (Ground). Splice for quick repair. Used in electric go carts. Spring loaded Hall Effect Throttle Control and 40 inch 3 wire cable harness (terminating in bare wire), Red (4.3 Volts), Green (or blue - Speed Adjusting Signal), Black (Ground). Splice for quick repair. Used in Chinese electric go carts. Common finger 'Go Switch throttle' that fits 7/8" Diameter Handlebar. Works with relay sold below for many 100 watt scooters. 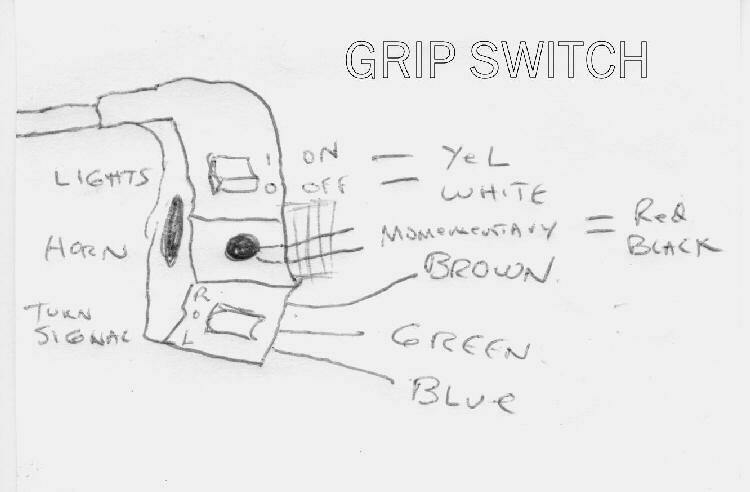 This grip switch comes with three switches: A two wire on/off light switch, A two wire momentary Horn Button, and a three wire Turn Signal switch that can also be used to control forward and reverse control boxes, if so desired (low current operation only such as reversable control boxes sold above). 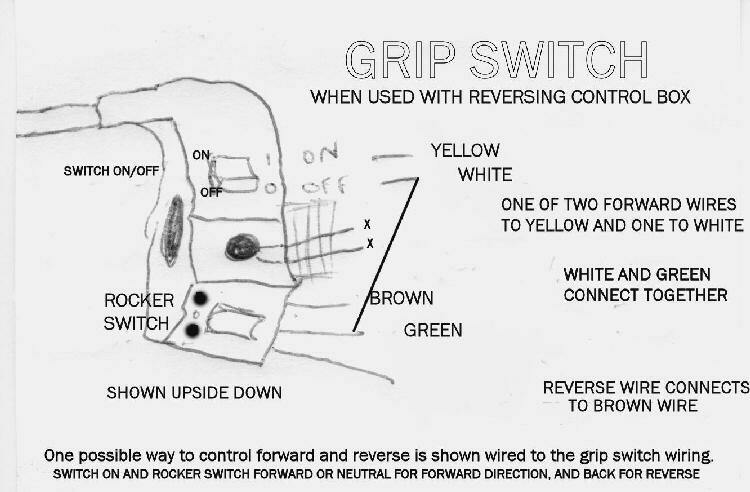 See grip switch normal wiring and wiring when used with reverse control boxes. The dash panel words Battery and Speed are centered under the icons (A - red housing) for version 2 Headlight assemblies. Version 1 (shown B in yellow housing) has the words to the side of the icons and limited to stock on hand and cosmetic condition may vary. Clear panel section only, does not include headlight housing shown in red or yellow in the pictures. Wiring information not included. No returns or exchanges. Available colors choices may vary: Burgandy, Blue, Yellow, Black and Pink options. Version 1 does not have a power switch hole in addition to the Ignition Key switch hole. Includes Headlight, turn signal lights, and Guages. Limited Quantities, subject to availability. Available colors choices may vary: Burgandy, Blue, Yellow, Black and Pink options. Version 2 has a power switch hole in addition to the Ignition Key switch hole. Includes Headlight, turn signal lights, and Guages. The dash panel words Battery and Speed are centered under the icons (A Type). Clicking these buttons to place an order indicates you have read and will abide by the Order Policies as printed on this web site. A 5 wire key switch used in small gas/electric scooters, pocket bikes and mini-choppers. Up to 5 wires can be used in connection but not required. 3 position. A 2 wire key switch and key set. For most electric scooters. 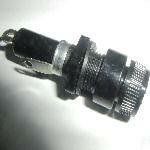 A 2 wire key switch for larger hole switches. Snaps in place. Vapor and similar scooters. Full size scooter mirror set similar to Vento Phantom style. Turn signals built into front of mirror. Bolt Size: M8 x 1.25. No returns or exchange possible.